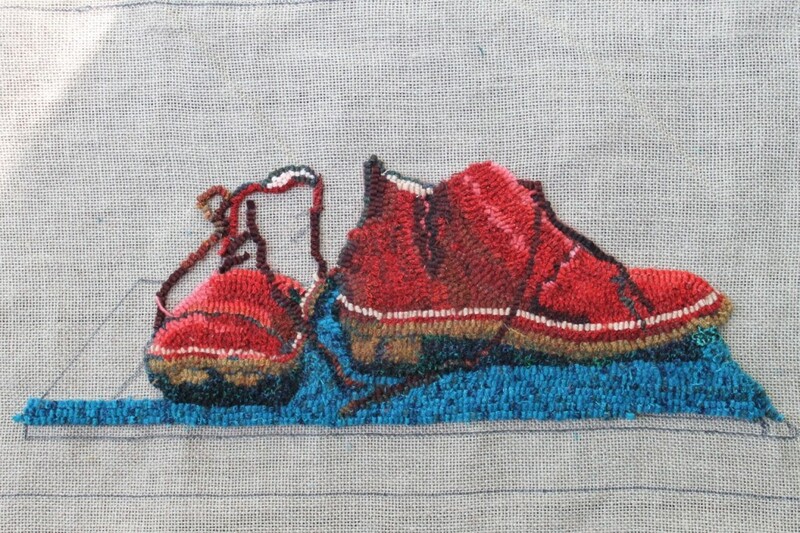 I’ve made a little progress on the red shoes–I am well into hooking the second shoe and have confirmed the base colour. Taking a photo of the piece as you go is very helpful. Errors which you don’t see when you are working on it, jump out. Or a certain part just nags; not glaringly wrong, but not right either. A black and white photo helps even more. 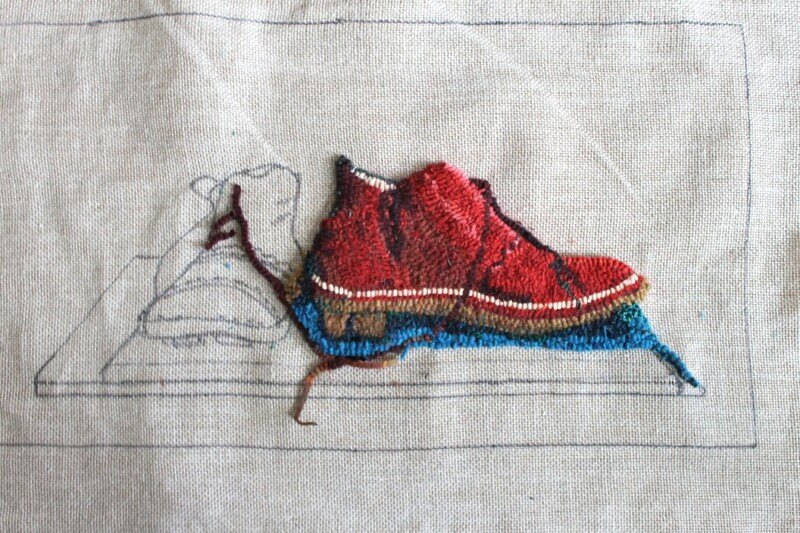 The second shoe needs revisiting, but I’m moving forward for the moment. The next decision is the background. I have some choices, so will report later in the week when I have made some progress. 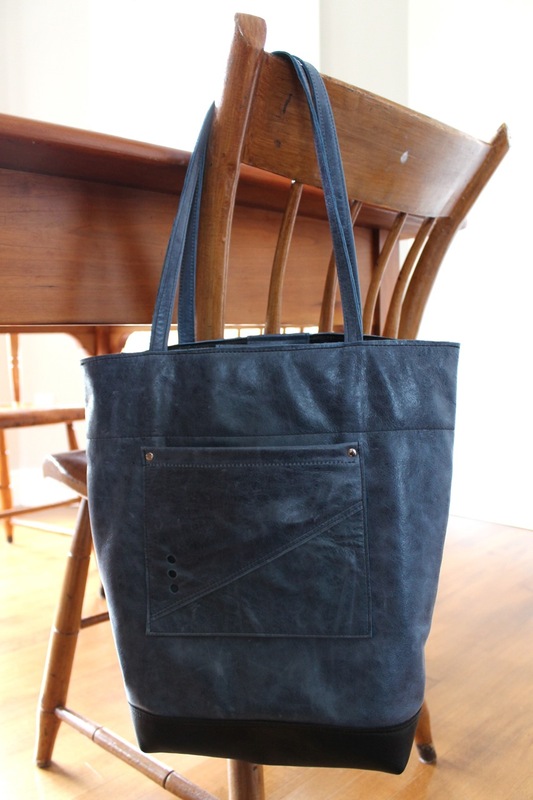 A third Delta Tote is in the works and in some ways this one is my favourite. 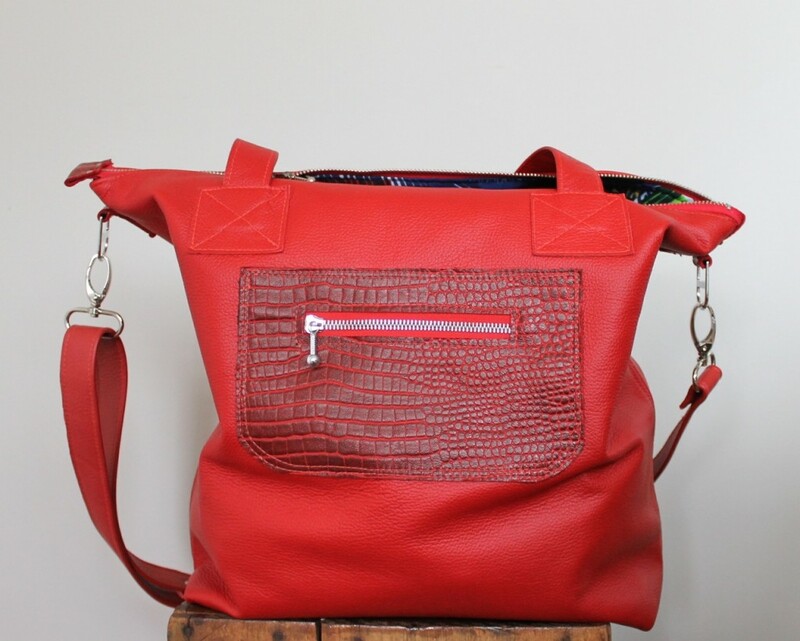 This tote is made from beautiful pebbly toffee-coloured leather with a big pocket on the front with a magnetic closure. 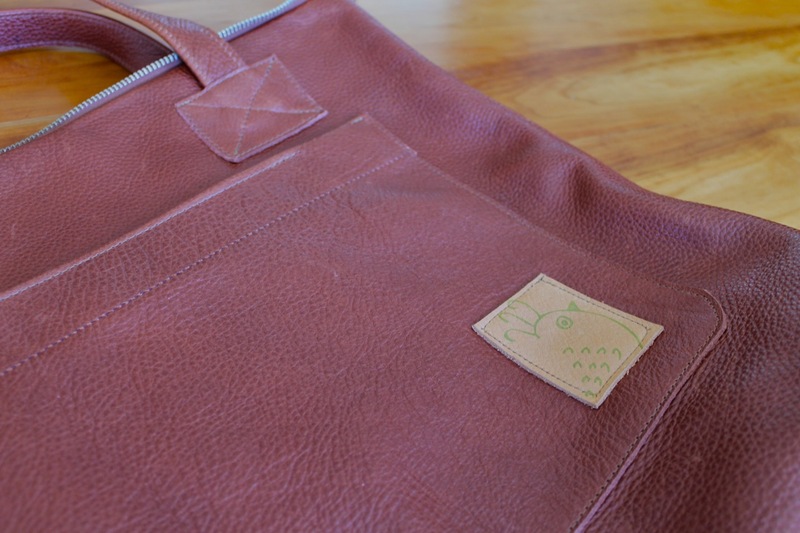 The birdbrain logo screen printed on a piece of coordinating leather is stitched on the pocket. Otherwise it has all the features of the other deltas and should be in the online store soon. It is sunny today and I got outside to do some work in the yard–the sun and the rake making a good combination for afternoon exercise. Yesterday was a different story–we went to the lake, with the thoughts of sketching. The temperatures were around freezing with blowing snow and punishing winds. I took this photo with my phone of the menacing but spectacular view from the shore. So one phone photo, no sketches. 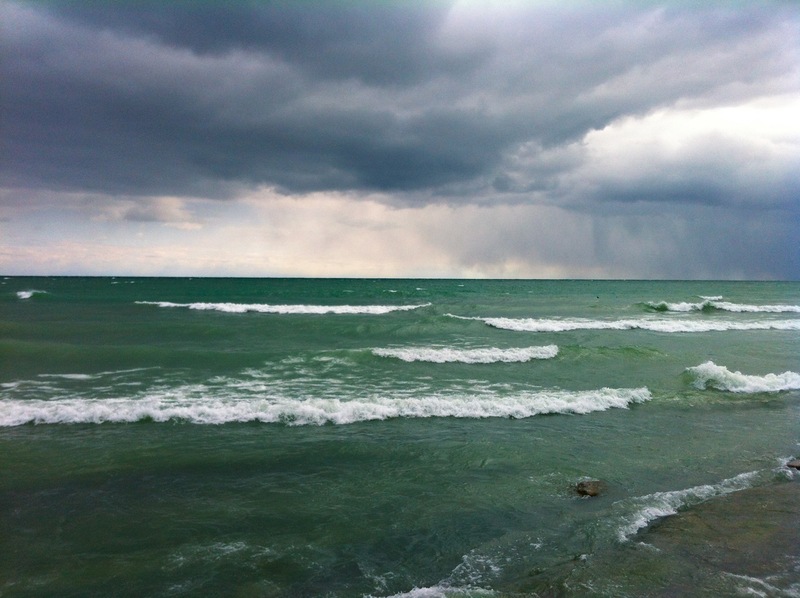 We shivered in the car and watched five guys try, without much luck, to surf the waves. 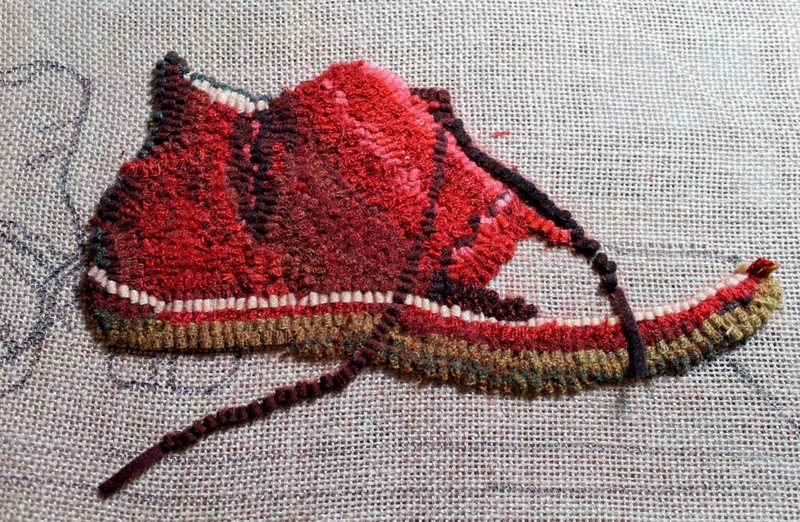 But back to the shoes…my left shoe is pretty much done, except for some tweaking in the heel area. Those rubber pieces are hard to make look right. I think I am happy with the colour of the mat they are sitting on — and have some ideas for the background. I am soon going away for a week where there should be lots of time for hooking so I want all the decisions made before I leave. I will be packing up the wool and my cutter and, if I am lucky, will come home with it much of it done. Yesterday I was in Napanee for a meeting about the upcoming OHCG Annual where I am giving a talk. 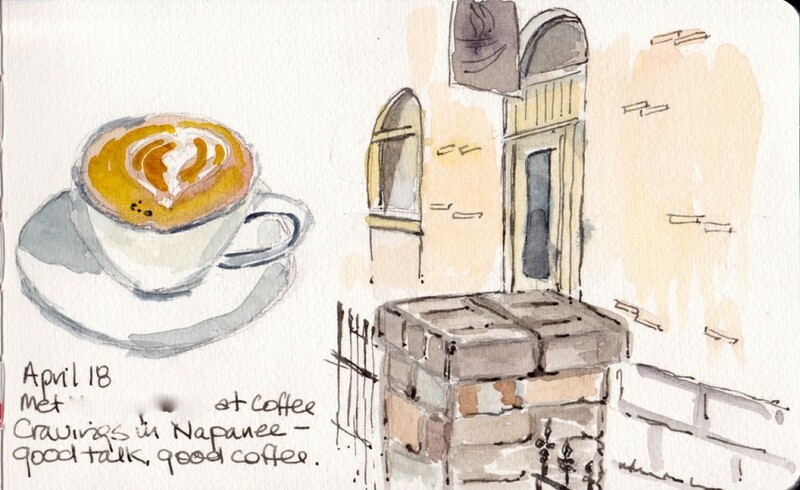 Napanee is one town east of my town–with, as I discovered, a great independent espresso bar. How perfect to find a unique coffee spot with a congenial atmosphere and personal connection and great coffee–in a historic building to boot. It was a cold, windy day–but I had time to begin a quick sketch, mostly in the car (!) and finish it at home. On another front, I have been hooking my left shoe. Here it is as it stands now. This is an exercise in looking and looking again. It’s a lot like painting–trying to see the shapes and the values. I have been doing a lot of pulling out as I try to make this shoe come alive, but as I said before, the wool and linen are very forgiving. 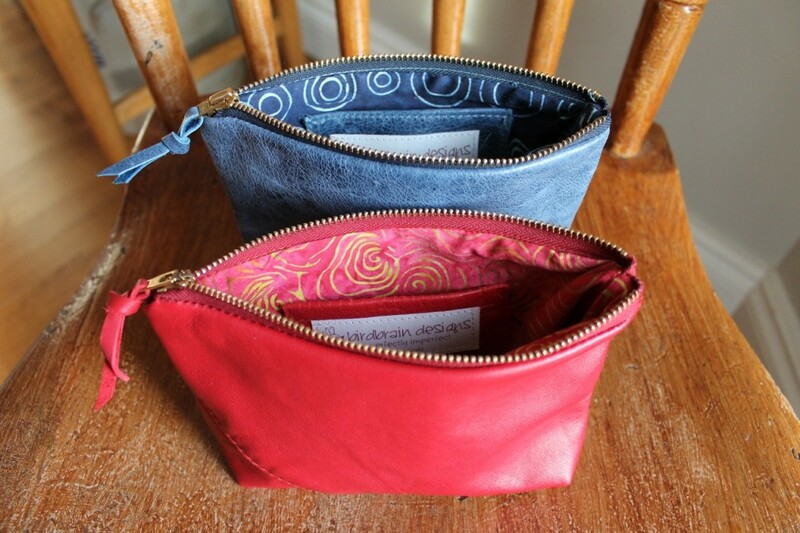 Here are two pouches which will be in the shop tomorrow. 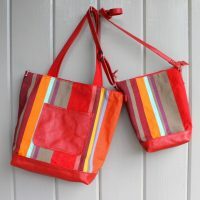 I’ll be doing a small run of these in various colours because I think they are ideal for spring. 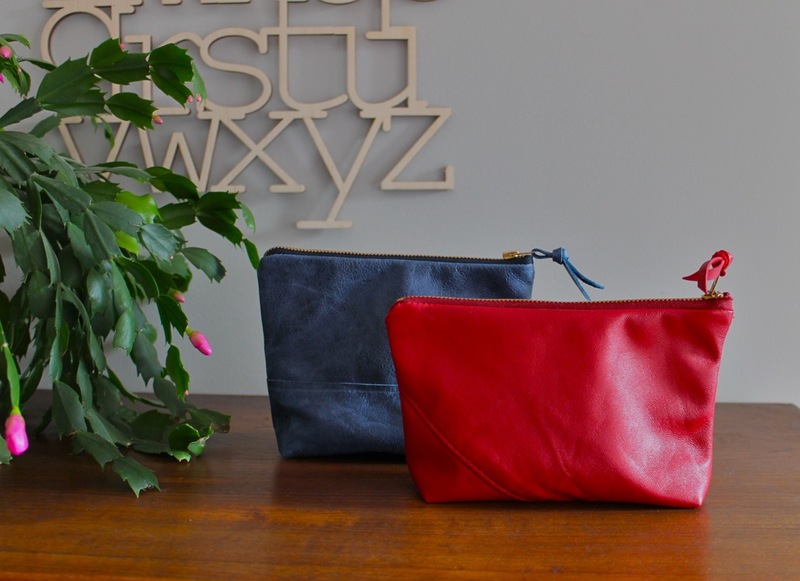 These pouches are big enough to work well on their own carrying your phone, cards and other essentials, or are great thrown in a larger bag. 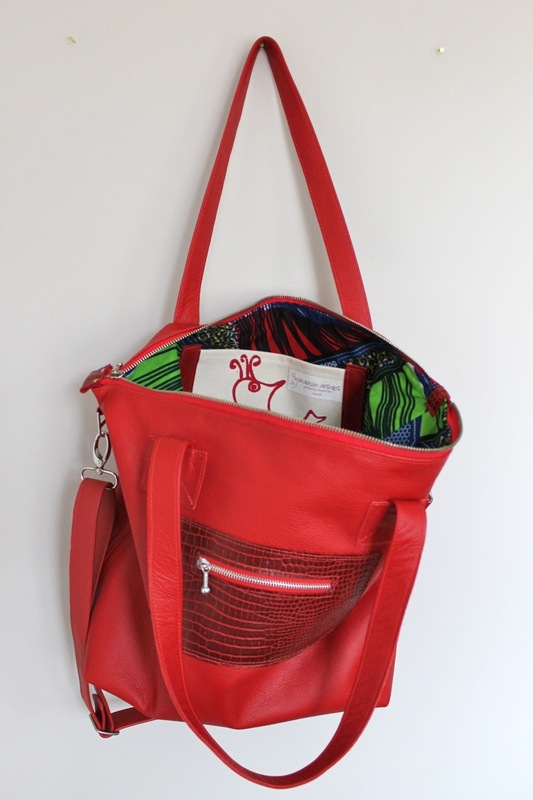 This is the new red Delta travel bag. Large and roomy with a wide fixed bottom and metal feet, it is the ideal tote for trips, short and long. 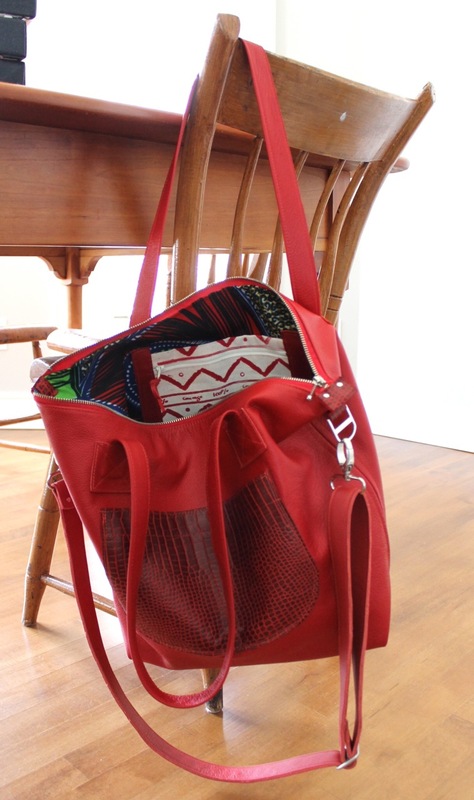 The exterior of the bag is lovely pebbly red leather and the interior is 100% Nigerian cotton. 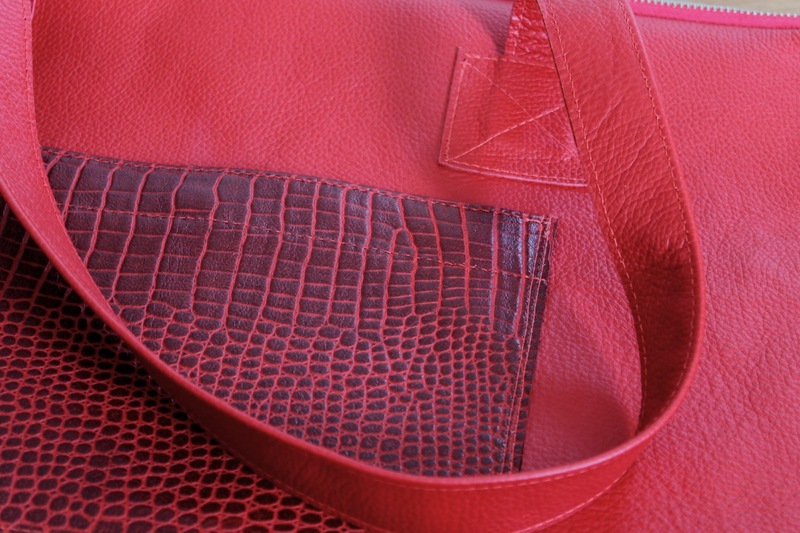 The details on the bag are red ‘croc’ including the magnetic pocket on one side and a zip pocket on the other. Inside there is a zip pocket and two slip pockets each constructed of strong canvas with birdbrain graphics. All hardware, including the metal zipper, is a chrome colour. 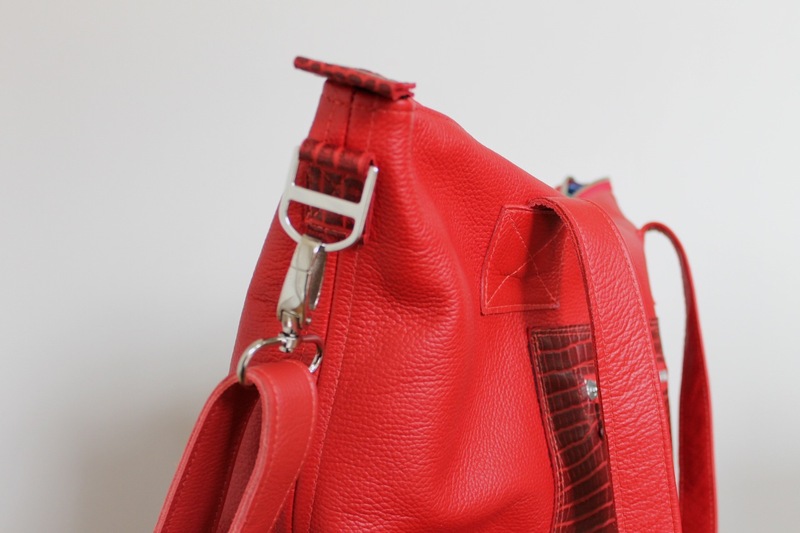 There is a removable shoulder strap which adjusts and two hand straps with a 10 inch drop. I find when the bag is full that it is good to have carry options–switch it from your shoulder to your hand for a while. The straps and loops are attached with the ‘delta’ detail cross stitching. I have been thinking about a shoe rug for some time, and decided to get down to it. I am envisioning a fairly big rug, but have learned that sampling is essential. 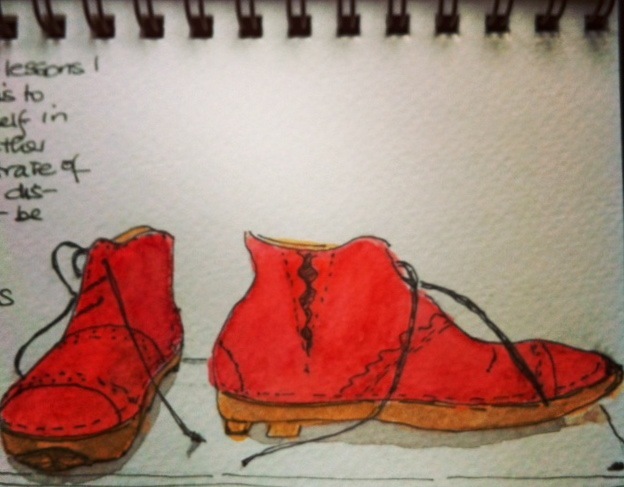 So…I am working on a smallish mat with one pair of shoes. 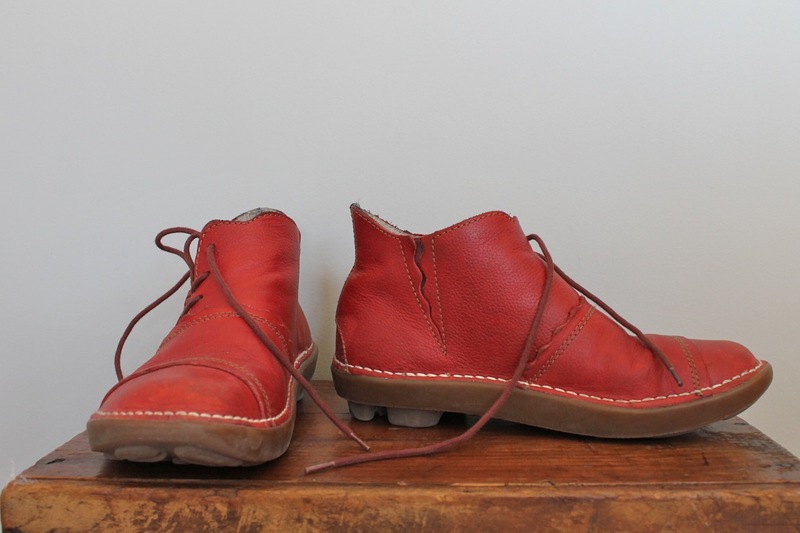 A favourite pair of well-worn boots actually. I began by painting them and then photographing them. 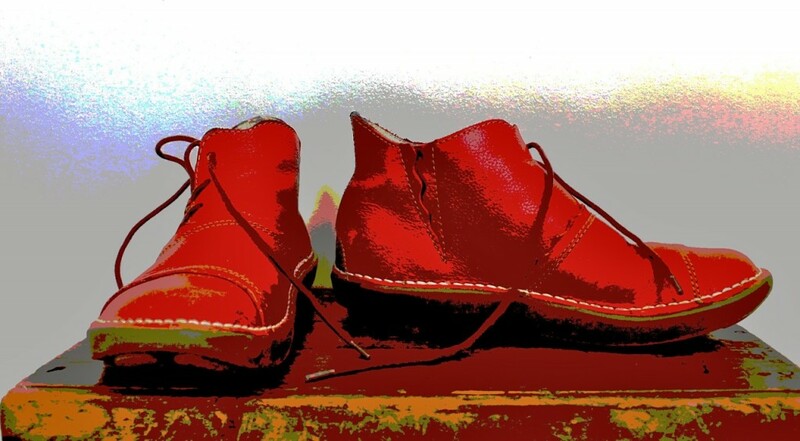 I am going to hook these shoes sort of like hooking a portrait. So my next step was to posterize them in photoshop. 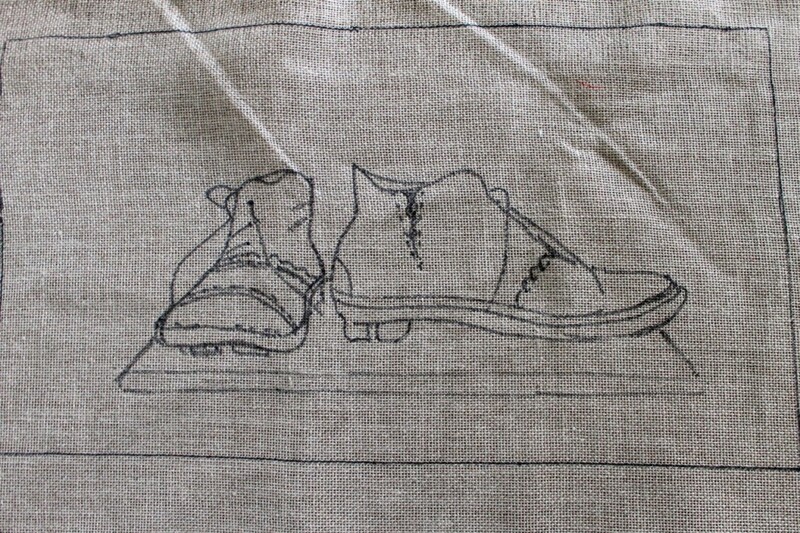 And draw them on the linen, a fairly small piece, about 12″x24″. My friend June suggested it is the perfect door mat size–so I thought why not turn the box the shoes are sitting on into a mat and hook a door mat of a door mat? Maybe the big rug will be a door mat with a pile of my shoes on it. At this point I have given no thought to the background–colour or design. I know this breaks some rules, but it is the only way that works for me. I’ll turn the box the shoes are sitting on into a mat and try hooking the main motif first to see where that takes me. Does the shoe on the left look a bit like a duck’s bill? Yes, I think some adjustment is needed already–but that is the beauty of hooking; it’s way more forgiving than painting. Next step is finding six or seven values of red in my stash and picking up my hook. The blog has been quiet for a few days–problems at headquarters! 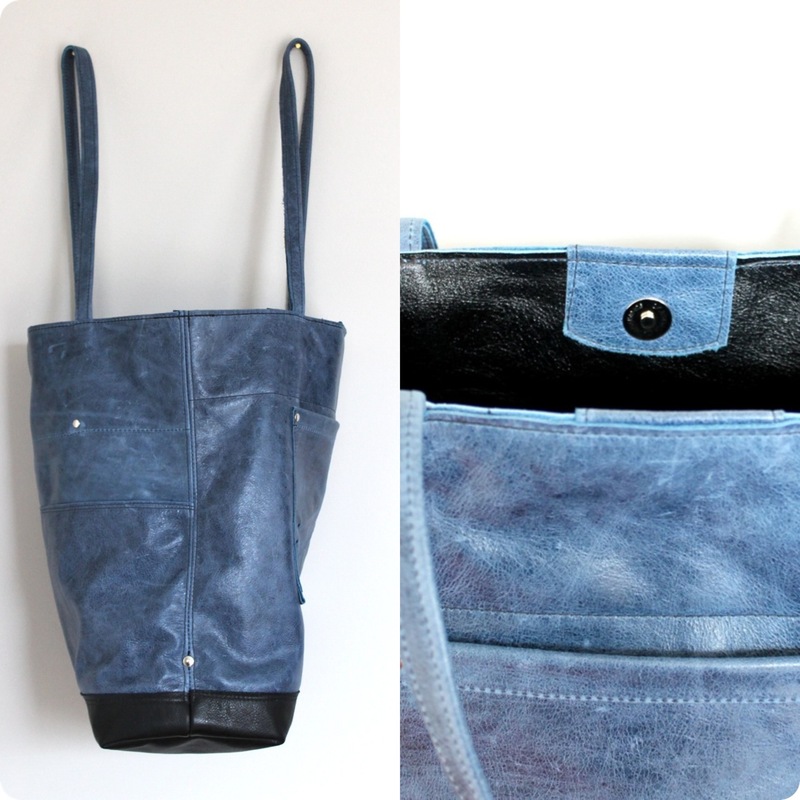 But things seem to be running again, so time to introduce two new bags. The first is the 3spot Tote. 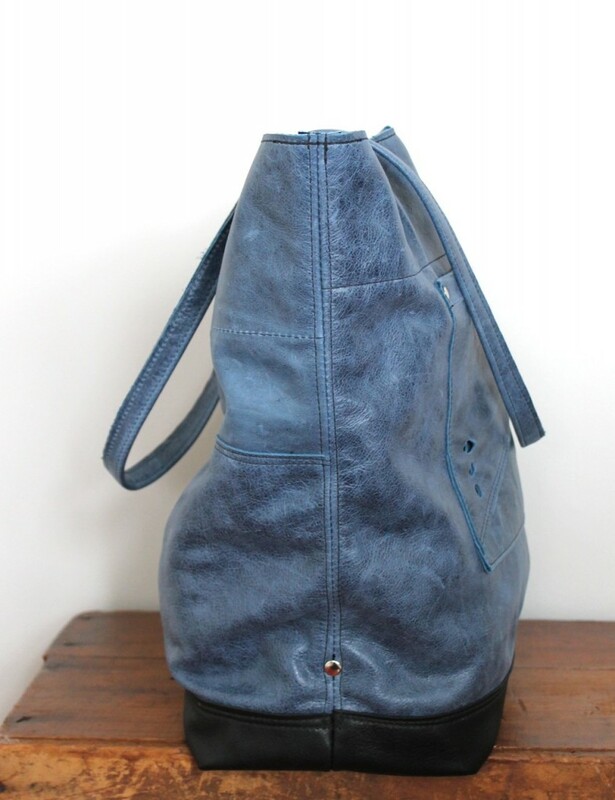 It is made from the remainder of the wonderful blue distressed leather used in this–with some black pebbly leather from a coat on the bottom and inside. 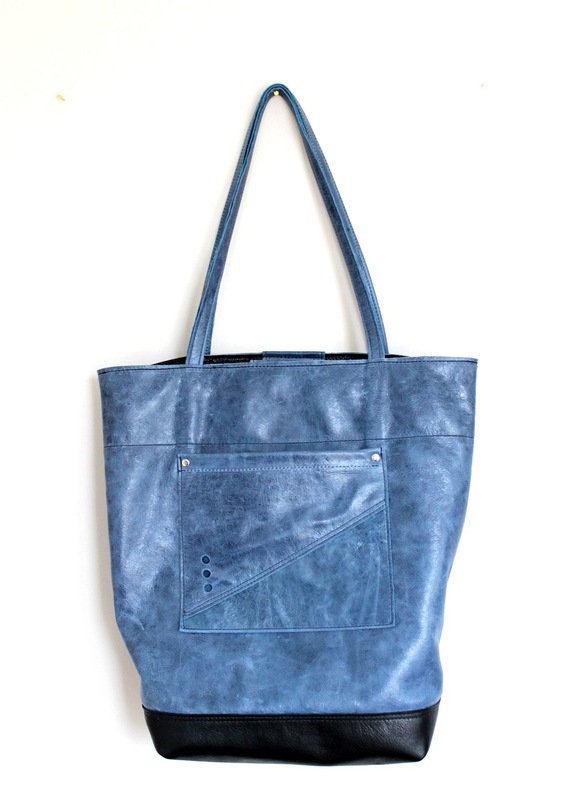 I incorporated all the things I like in a tote–magnetic closure, large outside pocket, inside leather split pocket for phone and other small essentials, shoulder straps that are not too long for carrying straight out and a double leather bottom for strength and a neat finish inside. Rivet and punched hole detail. It measures 14.5″ x 14″ x 6 with a strap drop length of 10″. This tote will be in the shop tomorrow. This is the next version of the Delta–in red with croc pockets and detail. I’m still working on this one, but I am loving it so far.